I’m a little confused about what farinata actually is. If you google it, most links lead you to the conclusion that it’s a chickpea flatbread like socca. Yet my new cookbook on Tuscan cooking has it as a stew from Pistoia, a region of Tuscany just west and north of Florence. It doesn’t really matter as recipes are regional by their very nature, and adaptable, and transformable, and personal. So my farinata is a polenta stew – the epitome of peasant, homegrown, comfort food. Picture a little stone house in a Tuscan valley with a small kitchen garden outside full of fall bounty like carrots, cabbage, celery, tomatoes, and herbs. Now add a little wine, a few beans, some polenta and you’ve got a meal that will warm the bellies of the whole family. Cheap. Easy. Filling. Tasty. With leftovers for lunch in the field the next day. Place beans in a large pot with plenty of water, one garlic clove, sage leaves, and bay leaf. Bring to a boil and cook beans until tender, seasoning with salt towards the end of the cooking time (this is important – if you add salt too early your beans won’t cook). Meanwhile, bring a pot of lightly salted water to boil. Add the cabbage and simmer for about 5 minutes until cabbage is tender. Drain and chop. Heat olive oil in a heavy dutch oven or large pot and add the onions. Cook until tender. Add carrot, celery, and garlic. Saute until tender. Add tomatoes and chopped herbs. Let simmer for about 3 minutes. Add white wine and let it reduce by about 1/2. Drain the beans, discard the sage and bay leaves, reserving the cooking liquid. Place half the whole beans in the dutch oven with the other other vegetables. Mash half the beans and garlic clove with a potato masher until they turn into a paste. Add them to the dutch oven along with the cabbage and 2 cups of reserved cooking liquid from the beans.Let simmer for about 20 minutes. Pour 4 1/2 cups of the rest of the remaining cooking liquid into the dutch oven. Season with salt and pepper and then sprinkle in the polenta. Cook, stirring regularly and adding more cooking liquid or water if necessary, for 40 minutes, until thickened and cooked through. If you want to make this farinata true Tuscan style, stir in 4 tbsps grated pecorino cheese. 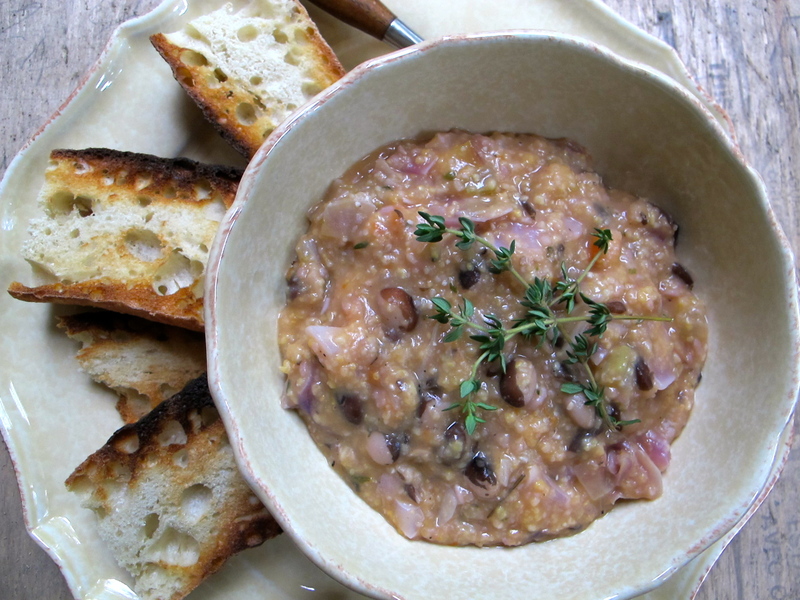 Either way, ladle into bowls and serve with crunchy artisanal toast and a glass of wine from the region.